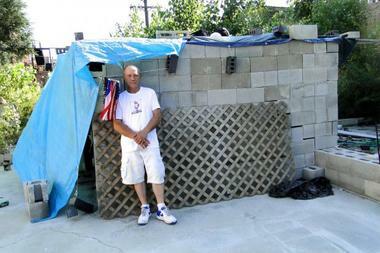 A homeless man built a cinderblock home on a failed condo development site. WICKER PARK — Since two condo developers went belly up, a parcel of land on the western edge of Wicker Park has been bank-owned, and neighbors say they've never seen anyone from a bank on the neglected property. But they do see Bruce Johnson. In the last week, Johnson, 51, who has been squatting on the failed Wicker Park condo development site since June, went one step further: He built a home. About 8 feet by 10 feet, the home is constructed from piles of cinder block and brick initially intended to be used for condos. It has enough space for a twin mattress, a rack of clothing and a dresser. A window sill houses a Scooby-Doo figurine, a mini-gumball machine, Christmas bells, toy cars and trinkets Johnson said he picked up from years spent working for carnivals. "I was looking for a place to be dry, to not be bothered. I was looking at the bricks every day, figuring why not put a bunch together? Why not use what's here?" Johnson said. Johnson's hut, which he built in a day, is on the southern end of the lot, while the front portion of the lot faces a busy street and contains concrete foundations that at one point were supposed to house three, three-story condo buildings. The condos would have brought a total of nine new residences to a somewhat sleepy corner of Wicker Park, just east of Western Avenue. "The bank owns it, but they never come around," said Benny Hernandez, 78, who lives next door to the lot, which is guarded by a tall fence covered in green canvas. Hernandez said so much time has elapsed since the bank took over three years ago that trees have sprouted up on the site. "It looks like a jungle. As long as there's no wild animals like the jungle there, it's OK with me," Hernandez said. Meanwhile, Johnson, who took a reporter on a tour of his home, said he realizes "It might not last long." "I'm taking it day by day," Johnson said of his temporary shelter. Before living on the lot, Johnson said he was thrown out of a foreclosed home he was living in in Humboldt Park. Johnson discovered the empty land in Wicker Park in May. "The gates were open. There were no signs saying no trespassing," Johnson said. Johnson used a blue tarp salvaged from a garbage bin as a roof and put a stuffed dog he found in an alley on the roof for decoration. "He needed a home too," Johnson said of the stuffed dog. A recovering alcoholic, Johnson said he's not worked since 2001 but gets by selling bottled ice water on street corners, selling scrap metal and cans he salvages and mowing lawns for a landlord he struck up a friendship with when he was squatting in Humboldt Park. Johnson said he attends an Alcoholics Anonymous chapter and eats dinner every day at the Franciscan Outreach Center's Marquard Center, which operates a soup kitchen at 1645 W. LeMoyne Ave. in Wicker Park, about one mile east of his hut. Johnson said no one at the soup kitchen knows where he lives. Meanwhile, his neighbors said they have "no problem" with Johnson and requested that his address not be revealed, for fear police would force him to leave. "I think it's cool he took advantage of it. The poor man is homeless, clearly. He doesn't pay attention to anyone, he's in his own little world, in his little mini-house," said one neighbor who wished to remain anonymous. "The way he handles it, it's like he owns [the land], we don't bother him," Hernandez said of Johnson. Hernandez added: "It's his own business, if that's what he likes, let him be. Most people get a check from government, they have enough [money] for a room, but maybe he couldn't get that, or doesn't want it."